A mere 32% of employees said they were "engaged" at work (engagement has remained flat since 2000). A majority of employees (50.8%) were "not engaged." Another 17.2% were "actively disengaged." "Engaged employees are involved in, enthusiastic about, and committed to work. Employee engagement is strongly connected to business outcomes. Engaged employees support the innovation, growth, and revenue that their companies need. Yet, most U.S. workers continue to fall into the not engaged category. These employees are not hostile or disruptive. They show up and kill time, doing the minimum required with little extra effort to go out of their way for customers. They are less vigilant, more likely to miss work and change jobs when new opportunities arise." Aon Hewitt defines engagement as the psychological state and behavioral outcomes that lead to better performance. 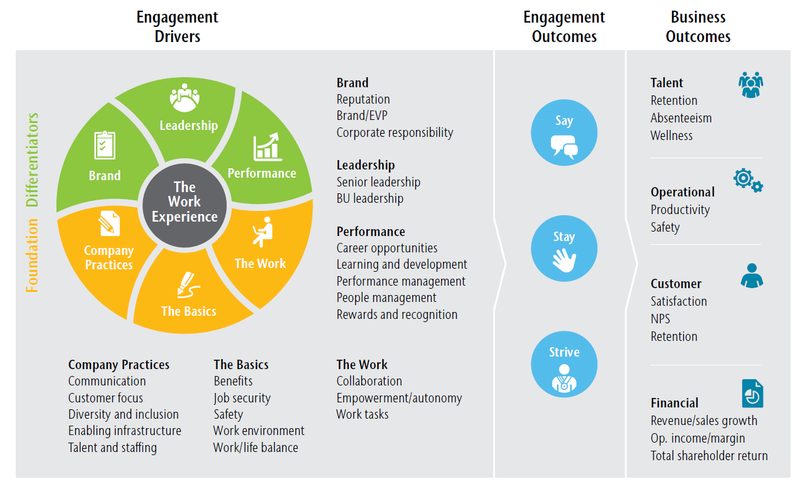 The Aon Hewitt engagement model examines engagement outcomes as Say, Stay, and Strive. Say - speak positively about the organization. Stay - have an intense sense of belonging to the organization. Strive - are motivated and exert effort toward success. "U.S. competitiveness has been eroding since well before the Great Recession. America's economic challenges are structural, not cyclical. It is imperative that Americans understand why U.S. performance is weaker than in recent generations and how solving our real problems will require us to make compromises. The fundamental manifestation of competitiveness is productivity. Only through productive citizens and a highly productive environment for business can a nation's firms pay high and rising wages while still being able to compete successfully in the national and global economy." "The systematic underinvestment in key elements of the commons, along with an inability to mount real solutions, has undermined both overall productivity and shared prosperity." The writing on the wall is clear. U.S. competitiveness has steadily been declining for nearly two decades. Productivity is at an all-time low. Real investments in growth sectors have declined while entitlement investments have risen. Businesses are happy to invest in efficiency innovations that churn out more and more cash but are employment-negative. Both income and wealth inequalities are increasing. The existing management models are broken. It is time for a new paradigm. Throughout recorded history, breakthroughs in civilization have occurred at different times. Many scholars, notably Jenny Wade and Ken Wilber, have tried to explain evolution as well-defined constructs. One of the vivid forms of understanding evolution is through colors - from infra-red to blue. 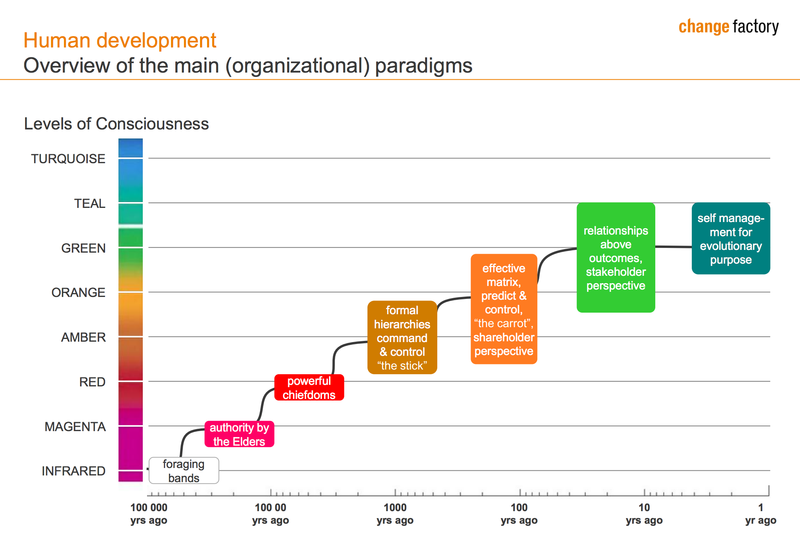 Frederic Laloux has portrayed the stages in terms of organizational design and outcomes in his fascinating book, Reinventing Organizations, Nelson Parker, 2016. The Red (impulsive) paradigm is 10,000 years old. A strong leader has absolute power over members of the group. Power structures can change when incumbents are challenged by stronger personalities. In today's context, the red organization is exemplified by street gangs, mafias, and brutally authoritarian regimes. The key breakthroughs are top-down authority and division of labor. The Amber (conformist) paradigm is illustrated by a tall hierarchy with well-defined lines of authority and control. Job titles and job descriptions describe people. Command and control is the dominant leadership style. Those lower down in the hierarchy simply follow orders. Typical Amber organizations are many government entities, the Catholic Church, the military, and public schools. The key breakthroughs are a stable organization chart and repeatable processes. The Orange (achievement) paradigm is defined by the pursuit of innovation and profits. Project groups, cross-functional teams, virtual collaboration, and staff functions become the norm. Orange is the dominant world-view today. The dominant metaphor is organizations as machines - with inputs and outputs, efficiency and effectiveness, information flows, performance measurement. Large organizations - from BMW to Exxon to Coca Cola - typify the Orange stage. Breakthroughs at this stage are through innovation, meritocracy, and accountability. The positive aspect of the Orange paradigm is that it has lifted hundreds of millions out of poverty. The flip side it is an absolutely materialistic model that cannot provide a sense of meaning to life. The Green (pluralistic) paradigm tries to overcome the limitations of Orange by looking at organizations as families. Green leaders insist that people are not cogs in the organizational machine. People are supposed to look after each other, in the nature of a community. Every member's "happiness" is considered to be important for organizational success. The breakthroughs are in the form of stakeholder value, a values-driven culture, and empowerment. Examples of Green organizations include iconic companies such as Southwest Airlines, Ikea, and The Container Store. The problem with Green is the muddy disconnect between precept and practice, between espoused values and reality. Green has aspirations towards egalitarianism but falls short due to the inherent conflict between stakeholders, and the failure to get rid of hierarchies. Since even Green has failed to achieve the notion of a welfare state or happy people who find meaning in life, it is time to think of a new model - Teal. Teal is an inward journey toward self-discovery, and simultaneously reaching the Maslowian level of Transcendence where the larger good defines our thoughts, words, and deeds. Teal requires a conscious abandoning of the ego, a sense of inner right as a compass, and a yearning for wholeness and meaning, a deep realization of our inter-connectedness. Teal organizations have no structure (and thus are similar to Holacracy) and are like cybernetic systems with complete feedback and open discussion opportunities (and thus are similar to Sociocracy). Examples of successful Teal implementations include Buurtzorg (Netherlands), RHD (US), Heiligenfeld (Germany), Morning Star (US), Favi (France), and Patagonia (US). It is important to note that the different stages are not mutually exclusive. There can be an overlap. As an example, in a crisis situation, the Orange or even Amber paradigm might be a good option. Once the crisis is over, the system can return to its stable state. Are you ready for Teal?